How can doctors adopt cashless payment system to handle demonetization positively? The sudden announcement of demonetization of currency notes of 500 and 1000 has directly impacted doctors. Patients mostly pay to doctors by cash, except in hospitals where they often go with cashless medical insurance. While many doctors have set up card swiping machines in their clinics, the majority of payments at clinics happen in cash. Thus doctors need to think how they can adopt cashless payment system to handle demonetization positively? Just imagine a patient coming to you for consultation. After consultation, patient needs to pay fees of Rs.300. She pulls out a new crisp note of Rs.2000 and you do not have enough notes of Rs.100 to give back the change! What do you do now? “Many patients are going for self-medication and buying medicine from local medical shops to avoid going to Doctor because of cash shortage. Some patients are bargaining and asking for discounts simply to minimise cash payout. Some are paying in instalments. Last month, my dues from patients grew to three times the usual! ” said Dr Abhay Shukla from Ambikapur, Chattisgarh. “First few weeks were impacted severely. We registered with a couple of popular mobile wallets by which they can pay us, but for that the patients have to initiate the payment from their side, which they conveniently forget! So those solutions are not addressing our need” said Dr Sudhir Ramanna from Ghatkopar, Mumbai. All of this is taking a lot of doctors’ attention away from their real job of curing patients. Furthermore, most doctors are not experts at collection-tracking and accounting. They are also not comfortable reminding patients for payments. On successful payment, that transaction is automatically updated in the patient’s financial records in bestosys which is not possible with other mobile wallets. 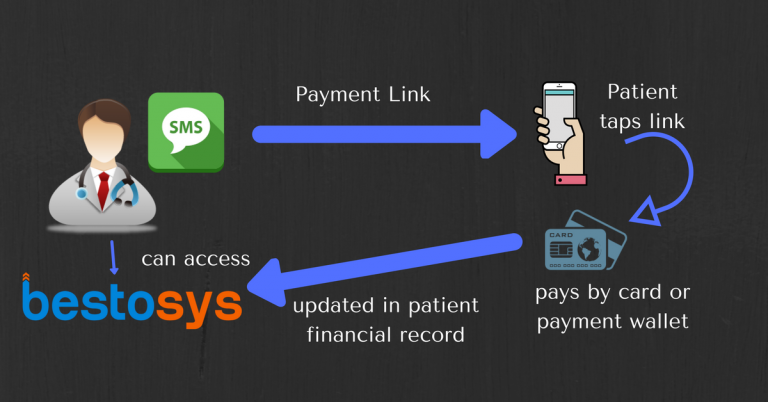 Furthermore, Doctors can send payment links to several/all patients at once. Each patient gets the link for payment due from him/her and can pay immediately from the comfort of home. No need to visit clinic just to pay. And the doctor doesn’t need to wait for payment till patient’s next visit. All payments received in bulk mode are also automatically updated in respective patients’ financial records. This is just one of the features in bestosys to help doctors manage and grow their practice. Bestosys is an end-to-end solution dedicated to the growth of doctors. To see how it can help you, try bestosys for free.